Last weekend I was ecstatic when I stopped into Ann Taylor Loft and discovered the “Julie” pant. These pants were made for people with curves on their lower half and felt like they were tailored for me. On top of the pure joy of finding pants that actually fit and were flattering, they were on clearance and on sale on top of that! (I always appreciate a good bargain.) I ended up buying 2 pairs of these linen trouser style pants, one in black and one in khaki. I also found a pair of navy capris in my size in the same “Julie” style that fit like a glove with just enough stretch and room to comfortably move. Here is how I decided to wear these to work. 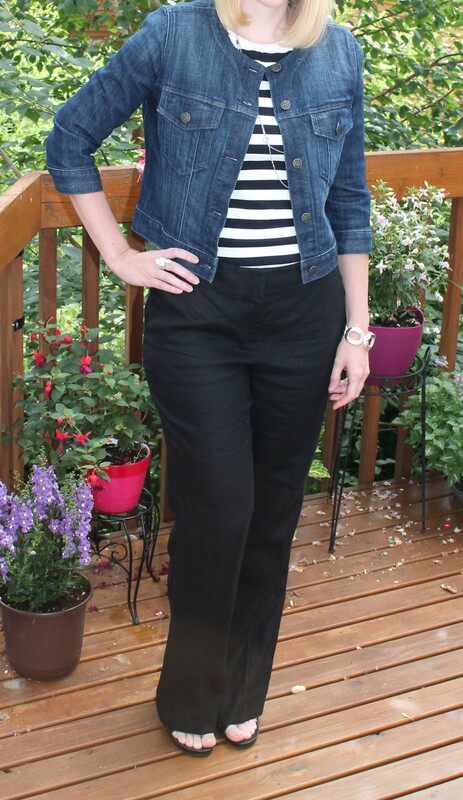 I paired the trousers with a black and white striped tee I bought at Talbots years ago, and a collarless blue jean jacket. I also thought they’d look better with a bit of a heel (I typically wear flat shoes) so I grabbed these Me Too sandals with a T-strap.